Ana–moly is a modern children’s lifestyle brand, aiming to create and enhance the surroundings of little minds. Its playful theme and vibrant coloured range of wallpaper's and tableware create a moorish sentiment. Our studio is dedicated to the creation of original design to fit our customer’s versatile taste and meet the current demand of innovative, contemporary, alternative style. Quintessentially British characters in desirable on-trend vivid colourways, subtle imagery with wry touch of humour. Designed and created all in the United Kingdom, we have an evergreen attitude. As a company philosophy all our wallpapers are PEFC certified, meaning only sustainable forests are used. We also use non-toxic organic inks, which are non-carcinogenic. Our new range of tableware for children, its durable material and fresh coloured designs will invite your little ones to enjoy and engage at meal times. 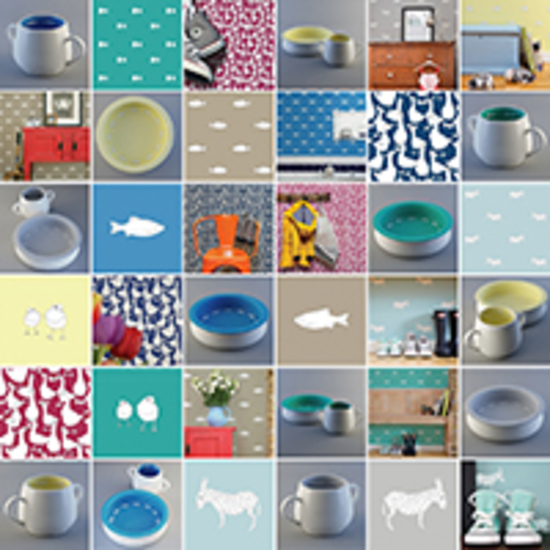 Paired with our wallpaper range, humorous animals decorate the inside, and give a friendly fun characteristic. All British sourced and made. Local earthenware clay is used which is the strongest material possible and is hand decorated in the famous Stoke-on-Trent. Lead free glazes are used to protect them from any nastiness and they are dishwasher and oven friendly, to make day to day use practical. Looking after today and tomorrow.